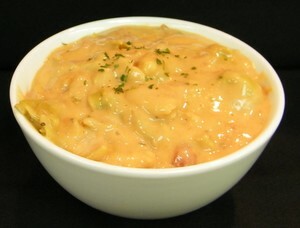 In a large stock pot, combine 1 qt Cream Soup Base and 1 qt Three Cheese Mac & Cheese Sauce. NOTE: Cream Soup Base Mix yields 1 gallon and Three Cheese Mac & Cheese Sauce Mix yields ½ gallon. This recipe uses 1 quart of each. Store remainder tightly covered in refrigerator for up to 5 days.